Due to its popularity, Moi Moi is often served at parties, dinners and other special occasions. Moi Moi can be very challenging to prepare because everything is mixed off the stove before cooking. If you get the mixing wrong, there is no going back once you start cooking. If you have tried cooking Nigerian Moi Moi several times but still cannot get it right, I suggest you watch the series of videos below and I promise you that after watching these videos, without skipping any parts, you will become a professional in cooking Nigerian Moi Moi. 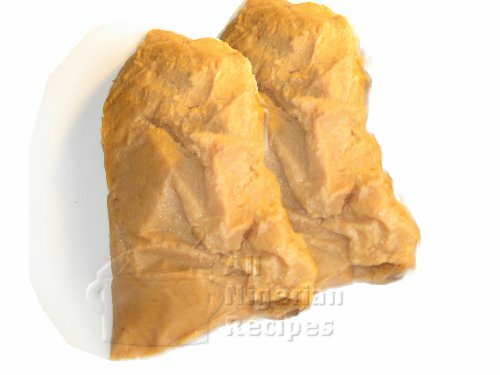 Video of all the ingredients and utensils you need to cook Nigerian Moi Moi and why they are important. This video includes how to make aluminium foil bags in case you do not have the moi moi leaves. Click here for the video. Video of the easiest way to peel beans for Nigerian Moi Moi. Click here for the video. Part 1 of cooking and baking the Nigerian Moi Moi. Click here for the video. Part 2 of cooking and baking the Nigerian Moi Moi. Click here for the video. Part 3 of cooking and baking the Nigerian Moi Moi. Click here for the video. Because these videos were recorded live, I answered lots of questions asked by those watching me live. So I recommend you take the time to watch all these videos. You will be happy you did. Nutmeg gives the Moi Moi its classic taste. If you've ever eaten Nigerian Moi Moi at a party and wondered why it tastes better than the ones you make, it is probably because you do not add nutmeg to your Moi Moi. Cut the onions into pieces, grind the crayfish with a dry mill. If using the heavy duty grinder in Nigerian markets, these won't be necessary.